February 23, 2015 -- Lives; running, posted at Links International Journal of Socialist Renewal with the author's permission -- When I was young, I used to believe that I knew what a revolution would look like. It would begin with a bitterly unpopular government and a political system which allowed no space for dissent to be expressed. Anger with the government would rise and, with it, popular organisation, until the will of the people would be like a great wave of water overwhelming every wall put up by the enemy. An alternative revolutionary government would be formed; it would derive its support from the workers, winning other classes to their side because of the wholly principled way in which it would deal with every social question. It would be opposed by the wealthiest people in society and everyone willing to ally with them. Some kind of civil war would follow between these two powers. And then, when the triumph of the revolutionaries was complete within that first, fortunate nation, next they would face, and hopefully, but without any guarantee of success, defeat the hostility of the most powerful states of the rest of the world. Therefore, especially in those countries that have seen a permanent shift towards a form of (albeit limited, capitalist) political democracy, I find it increasingly difficult to conclude that popular resistance will be expressed solely in society and not to some extent also in the state, that is, in part through the emergence of anti-system parties which stand for office and are part of a revolutionary alliance. Indeed the ascendancy of SYRIZA forces those of us who wish the Greek left well to think through unfamiliar questions about what the traditional goal of a revolution (i.e. the smashing of a state) means, in circumstances where a serious left-wing party finds itself temporarily, seemingly, without domestic opponents and faced with an enemy that appears to exist only several hundred miles away. 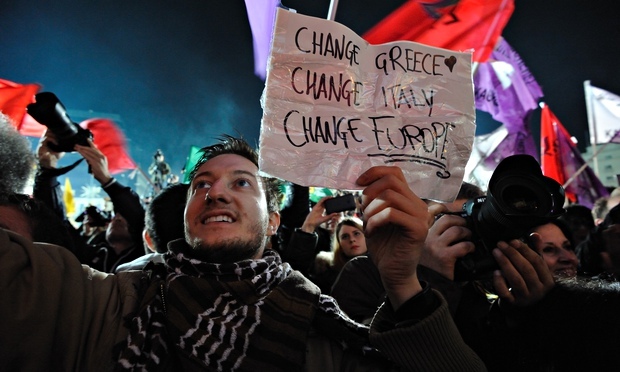 It is a part of the answer to respond that SYRIZA’s enemies are not solely overseas. As I write, SYRIZA’s economists are drawing up – with many refinements, and under the shadow a troika veto – proposals to increase the income of the Greek state and reduce its expenditure. To do this, while at the same time raising pensions and the minimum wage and halting the previous government’s privatisation program, they inevitably will have to promise that SYRIZA will suddenly clamp down of tax avoidance to an extent previously unthinkable in Greece. The repressive power of the state has, under conditions of neoliberalism, been dispersed a little across different kinds of institutions and relocated to some extent from the national to the international and from the political to the economic sphere. It follows that what is needed is a successful struggle against all the institutions of the rich, Canary Wharf as well as New Scotland Yard, the European Central Bank in Frankfurt as much as the parliament in Athens. It follows that you should always start if you can by assuming good faith in your fellow socialists. They are linked to you and you are linked to them, and they are entitled to a sympathetic hearing. The mistake of Yanis Varoufakis is not that he has spent too little time studying game theory. The problem with Alexis Tsipras is not that power has been thrust on him unexpectedly; rather he and his allies have spent three years preparing in their minds of this moment, and they have thought already as best they could the problems of every eventuality. If, for example, they do not believe that voluntary policies of Eurozone exit are a panacea, then we do not need to invoke bad faith or the simple label of “reformism” to explain their failure (especially not those of us who have long been sceptical of the politics of capitalism within one country which underpin the Grexit plans).